Special Anointing Oil for Healing & Blessing by Victorie Inc.
Oil was used also for medicinal purposes. It was applied to the sick, and also to wounds (Psalms 109:18; Isaiah 1:6; Mark 6:13; James 5:14). Did you know high quality anointing oils and ointments made with natural ingredients (not synthetic fragrances) have many physical healing attributes. When you purchase our anointing oils you are supporting olive tree farms in Israel, and other small farms and distillers around the world. Our customers appreciate the integrity of our oils and knowledge to use them effectively. From our hands to yours with God's Love! Are anointing oils still used today? The answer is yes. A scripture in the New Testament says " Is any among you afflicted? let him pray. Is any merry? let him sing psalms. Is any sick among you? let him call for the elders of the church; and let them pray over him, anointing him with oil in the name of the Lord: And the prayer of faith shall save the sick, and the Lord shall raise him up; and if he have committed sins, they shall be forgiven him." Our Biblical anointing oils are a symbolic representation of our faith in Jesus Christ to answer prayers for others and ourselves. They can be used for prayers of healing, blessing, intercession, encouragement, protection, miracles, and worship. To anoint your loved ones, the sick, or those in need, simply dab a small amount of anointing oil on their forehead or palms of their hands and pray. These special anointing oils are designed to to help the individuals overcome strongholds in their lives. Our mission is to draw you closer to God through His Word and TRUE fragrances mentioned in the Bible. Anointing oils created in accordance to Biblical standards and traditions have a SPECIAL PURPOSE and FRAGRANCE that would were common place in Biblical days. They are created using real plant, tree, flower, resin, herbs and extracts and may employ ancient techniques of infusion, enfleurage and maceration. Modern day anointing oils often smell like sweet perfumes and are designed to be pleasing to the senses and are frequently made using synthetic fragrance oils obtained from a perfume/chemical lab. There is nothing wrong with using modern day anointing oils, however, we feel you should have the right to make an informed decision about the products you are using to anoint yourself with. To DISCERN the type of anointing oil being purchased in the Christian Marketplace is difficult today. One would believe if the label or advertising description says Frankincense & Myrrh or Spikenard it is real deal, however, this is not the case. Often times anointing oils are simply made with inexpensive perfume fragrance oils or a mixture of ingredients and given a name without regard to the spiritual CONFUSION it may create for the buyer. It is time for the truth to be exposed! Victorie Inc. anointing oils are created in accordance to Biblical standards and traditions and only contain pure and natural ingredients, with the exception of Lily of the Valley and a few other scents that are unable to be produced from natural ingredients or requested by popular demand. 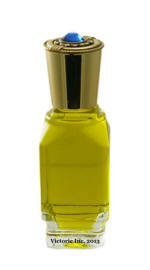 If one of our anointing oils contains a synthetic perfume fragrance it will be clearly stated on our website. You can buy with confidence from Victorie Inc. and we invite you to discover the TRUE unadulterated fragrances of the Bible. To gain more insight and understanding about the TRUE fragrances in the Bible we recommend becoming familiar with authentic plant material and extracts. To assist you on your journey we offer a large selection of high grade pure essential oils, herbs and resins. We also offer consultations and training for those who are interested in creating products using all natural ingredients. You can trust the source of products that you purchase through Victorie Inc. Perfect for wedding favors, gifts, conferences! Save$$$. How can anointing oils be used? Click here. Need more information about how to use or make your own anointing oils? Click here. Anointing Oil Formulary. We will be adding new recipes frequently. Click Here.